A couple years ago, I wrote out some thoughts for Holy Week. They were centered around some of the places that Jesus encountered during his last days before his crucifixion. This year, I thought I’d offer some devotional thoughts on some of the last words he spoke. These are simply meant to give us all some things to think about as we process Jesus’ sacrifice. Though Matthew doesn’t quote Jesus saying this, he does record that “Jesus began to show his disciples that he had to go to Jerusalem and suffer many things from the elders, chief priests, and legal experts, and that he had to be killed and raised on the third day” (Matthew 16:21). Personally, I think it’s crystal clear that Jesus knew what was waiting for him in Jerusalem. The portrait that the gospels paint of Jesus is of a man who is well aware of the directions that the winds in Israel were blowing. Between Rome’s empire and Israel’s coming, religion-fueled violent revolution Jerusalem was not the place to go if you (a) wanted to stay safe while (b) preaching the arrival of God’s kingdom. But safety isn’t part of Jesus’ agenda. Unless he chooses to change his message (God is King) or his strategy (non-violent resistance and prophetic pronouncements), Jesus knows what waits for him in Jerusalem: the might, power, and force of the temple and the religious establishment (backed by Rome’s interest in keeping the tax money flowing). Jesus may not be a mathematician, but I imagine he can add, and he can see that this is going to end badly for him. But that’s exactly why he chooses to go. I don’t know if Jesus was “afraid” in any sense that we may understand that word, but at any rate he sees where the danger and darkness lies, and he walks straight towards it. For many of us, we don’t need to look very far for darkness and danger. For a lot of us, we have wilderness and black caves inside our own souls; that’s where our darkness is. There are things—brokenness, fears, unconfronted/unacknowledged sin—lurking deep inside of our hearts and lives. They may be backed by the power of years of co-dependency and escapism, and we may be well aware that to confront them may very well mean pain and even death of parts of us. But in the same way that Jesus knows, and still goes, I think we are called to go: go to the dark places inside us, the places that are rooted in the power of this world, that will buffet and beat us as soon as we show up. 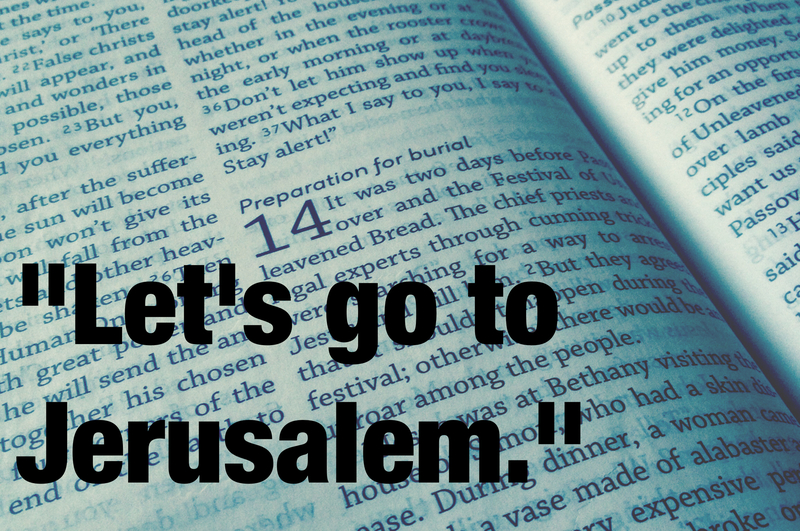 What is your “Jerusalem”? An addiction? A vision of your future that you’ve clung to? Your pride? What would it mean to walk towards it, to face it, and then to surrender so that God can begin to heal you? This entry was posted in faith and tagged bible, faith, holy week, Jesus, spirituality. Bookmark the permalink.